Objective To investigate the effects of cardiorespiratory and strength exercises on disease activity for patients with inflammatory rheumatic diseases (IRDs). Design A systematic review with meta-analysis registered at PROSPERO (CRD42015020004). Data sources The databases MEDLINE, AMED, Embase and CINAHL were searched from inception up to April 2016. Eligibility criteria for selecting studies Trials were included if they were randomised controlled trials of adults with IRDs, comparing the effect of cardiorespiratory and strength exercises with usual care on disease activity and followed the American College of Sports Medicine's exercise recommendations. The primary outcome was disease activity in terms of inflammation, joint damage and symptoms. Data synthesis Data were pooled in a random-effect model for all outcomes, and standardised mean differences (SMDs) were calculated. The quality of evidence was evaluated according to the Grading of Recommendations Assessment, Development and Evaluation approach. Results Twenty-six trials with a total of 1286 participants were included. There was high to moderate quality evidence, for a small beneficial effect on disease activity scores (0.19 (95% CI 0.05 to 0.33), p<0.01) and joint damage (SMD 0.27 (95% CI 0.07 to 0.46), p<0.01). Furthermore, moderate quality evidence for a small beneficial effect on erythrocyte sedimentation rate (SMD 0.20 (95% CI 0.0 to 0.39), p=0.04) and for no effect on C reactive protein (SMD −0.14 (95% CI −0.37 to 0.08), p=0.21). Beneficial effects were also seen for symptoms. Conclusions The results of this review suggest beneficial effects of exercises on inflammation, joint damage and symptoms in patients with IRDs. The main treatment goals in IRDs are to reduce disease activity and maintain physical function,4 5 and exercises are considered an important part of the management.6 Exercise is defined as physical activity that is planned, structured and repetitive, with a final or intermediate objective to improve or maintain physical fitness.7 Due to the clinical features of IRDs, exercises to maintain range of motion (ROM) and pain-relieving exercises in hot pools have been recommended.6 Unfortunately, these types of exercises have no effect on cardiovascular health.8 Cardiorespiratory exercise is shown to have an anti-inflammatory effect in healthy people and patients with low-grade inflammatory diseases,9 10 but it is more uncertain whether these effects also are seen in people with chronic inflammation. Yet, considering the protective effect of cardiorespiratory and strength exercises on CVD and inflammation in the general population,8 these modes of exercises should probably be more emphasised as therapeutic tools in the management of IRDs. In observational studies, inflammation and clinical symptoms in patients with IRDs are shown to be inversely associated with cardiorespiratory fitness and physical activity level.11–13 Furthermore, theoretical models on how exercises can potentially counteract inflammation and improve clinical symptoms in patients with IRDs have been suggested.14–17 Despite this, the evidence of the anti-inflammatory effects of exercises in IRDs is ambiguous. In two systematic reviews of patients with rheumatoid arthritis, it was concluded that strength exercises had a beneficial effect on inflammation and joint tenderness and that cardiorespiratory exercise had a small beneficial effect on pain.18 19 In contrast, Beavers et al 17 and Ploeger et al 16 concluded that there were limited and inconclusive data on the effect of exercises on disease activity in patients with IRDs. In brief, theoretical models of mechanisms are suggested on how exercises can counteract inflammation and clinical symptoms in IRDs,14 15 but the empirical evidence for such effects is still unclear. Therefore, the objective of this systematic review was to summarise the effects of cardiorespiratory and strength exercises compared with usual care on disease activity in patients with IRDs. The protocol for this systematic review was registered in the PROSPERO register of systematic reviews (CRD42015020004). The review group consisted of topic experts (SHS and HD), a methodologist (GS) and one review author who was both (KBH). The search strategy was prepared in collaboration with a healthcare librarian who performed the systematic literature searches. A broad search for articles was undertaken that contained terms for all types of IRD combined with terms for exercise and training. No limitations were applied regarding outcomes. We limited the search to clinical trials and reports published in English (see online supplementary file S1 for details of the search strategy). The original search strategy was developed for the Ovid MEDLINE database and then adapted for AMED, Embase and CINAHL. The literature search was performed from inception up to April 2016. A manual search of reference lists of relevant articles was also undertaken. Randomised controlled trials (RCTs) were considered eligible for inclusion. Studies were included if they investigated the effect of cardiorespiratory or strength exercises compared with usual care or other types of interventions not likely to influence cardiorespiratory or musculoskeletal fitness (such as ROM, stretching and relaxation). Trials were included if the effect was measured after completion of the exercise programme (ie, within a few days after completing the exercise programme. Follow-up trials were excluded). Furthermore, the length of the exercise interventions had to be ≥2 weeks. Trials were eligible if they had included adult patients (≥18 years) with confirmed IRDs (regardless of different diagnostic criteria). Trials with a mixture of different diagnoses of IRDs were also included. Trials were excluded if they had included patients with rheumatic diagnoses not involving systemic inflammation, such as for example osteoarthritis or fibromyalgia, as the aim was to assess the effect of exercise in patients with chronic inflammation. We had an explorative approach to the outcome measures, including all outcomes indicative of disease activity such as inflammatory markers, radiological joint damage, diagnosis-specific disease activity scores or clinical disease symptoms. The time point of interest was the first assessment after completion of the exercise programme (ie, within a few days after completion of the exercise programme). We also collected data on adverse events and side effects that were reported in the articles. Two review authors (SHS and HD) independently examined titles and abstracts against the eligibility criteria. All articles selected in this process were obtained in full text. All full-text articles were assessed independently by two review authors (SHS assessed all the full-text articles and then distributed them among the other review authors (HD, GS or KBH)). Disagreement among review authors regarding eligibility was discussed in the whole group of reviewers until consensus was reached. Authors of reports that were published after the year 2000 were contacted by mail in order to obtain data that were missing in the report, and a reminder was sent after 1 month if they had not replied. 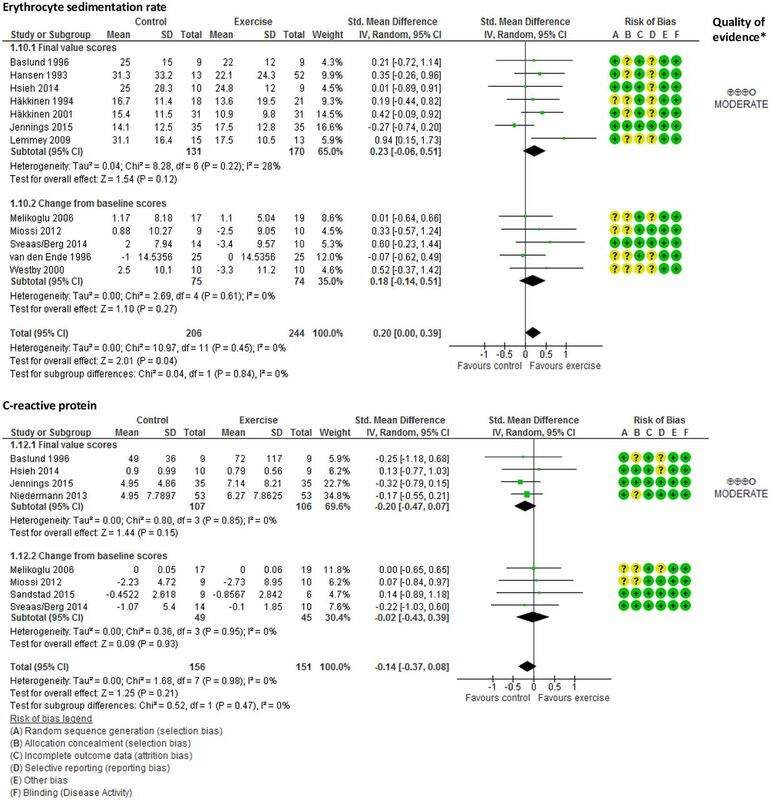 Methodological quality was assessed using the Cochrane Collaboration’s risk of bias tool22 based on published material and a hand search of trial protocols at clinicaltrials.gov and other relevant webpages. The methodological quality of the trials was assessed independently by two review authors (SHS and GS). Thereafter, the data were checked for inconsistencies and entered into Review Manager. Discrepancies were discussed by the whole group of reviewers until consensus was reached. Risk of bias assessments were made at the study level for (1) random sequence generation, (2) allocation concealment, (3) incomplete outcome data, (4) selective reporting, (5) other concerns about bias, and (6) blinding of outcome measures (this means that a study was rated with low risk of bias if it included objective measures of disease activity, such as C reactive protein, erythrocyte sedimentation rate, radiological joint damage (rated by a blinded assessor, and so on). We chose to not include blinding of participants and providers as a risk of bias item, because such blinding is difficult if not impossible in exercise trials. For each outcome, we evaluated the quality of the evidence across trials according to the Grading of Recommendation Assessment, Development and Evaluation (GRADE) approach (www.gradeworkinggroup.org). The quality of evidence was divided into four categories: high, moderate, low and very low, according to how certain we were that the estimate of effect was true (eg, high quality indicated that we had high confidence). Since all the trials were RCTs, they were a priori rated as high-quality evidence. Factors that could reduce the quality of evidence were risk of bias, inconsistency of results, indirectness of evidence, imprecision and publication bias. To perform meta-analyses, the data were extracted by two of the review authors (SHS and GS). The two reviewers discussed the data and reached agreement in every case, and a single, unified data set was entered into Review Manager V.5.3 software. For continuous variables, the standardised mean difference (SMD) with 95% CI was calculated. The SDs of change scores and final value scores were assessed before pooling the results to ensure similar precision. SMDs between 0.2 and 0.4 were considered as a small effect size, from 0.5 to 0.7 as a medium effect size, and ≥0.8 as a large effect size.24 Due to expected clinical heterogeneity between the trials, it was decided a priori to use a random-effects model for all outcomes. Heterogeneity was tested with χ2 measured by inspection of the I2 values that describes the percentage of the variability in effect estimates that is due to heterogeneity rather than sampling error.25 An I2 value of 0% to 40% is considered negligible, 30% to 60% represents moderate heterogeneity, 50% to 90% represents substantial heterogeneity and 75% to 100% represents considerable heterogeneity.25 A p value of ≤0.05 was considered statistically significant. cardiorespiratory exercise versus strength exercises versus a combination of strength and cardiorespiratory exercises. A total of 1783 records were identified by the searches. Of these, 94 were assessed in full text, and 26 trials (28 records) were included in the meta-analysis (figure 1). Excluded studies with associated reasons are shown in online supplementary file S2. Flow diagram of the selection of trials. ACSM, American College of Sports Medicine. The main characteristics of the trials are shown in table 1 (see online supplementary table S1 for description of the exercise interventions). The trials were published between 1985 and 2015, of which 25 were RCTs, and one was a cross-over study where results from each group before crossing were included. A summary of the risk of bias in the 26 included trials is shown in online supplementary figure S1. Four trials were rated as low risk of bias for all items on the methodological quality list.29 30 35 50 Eleven RCTs were rated as unclear risk of selection bias as the randomisation process was not adequately described.37 39–41 44 46–48 51 53 Seventeen trials were rated as unclear risk of bias as they did not provide sufficient information to judge if the randomisation process was concealed.27 28 31–34 36 39–48 53 The majority of the trials had a low drop-out rate and was rated as low risk of bias for this item. Only six trials were rated as a low risk of selective reporting as the protocol was available and in accordance with the published article.27–30 38 50 The majority of the trials included at least one objective outcome measure of disease activity and was rated as low risk of bias for this item. For outcomes included in ≥10 studies, the result of Egger’s test showed that the mean effect on erythrocyte sedimentation rate (intercept=2.17, p=0.05), diagnosis-specific disease activity scores (intercept=0.22, p=0.30) and pain (intercept=−1.15, p=0.09) was not subject to publication bias. The fail-safe number was, however, 7, 10 and 12 for erythrocyte sedimentation rate, diagnosis specific disease activity scores and pain, respectively, thus indicating a risk of publication bias for these outcomes. Twelve RCTs provided data on erythrocyte sedimentation rate, and the results showed moderate quality evidence for a small beneficial effect of exercises (SMD 0.20 (95% CI 0.00 to 0.39), p=0.04) (figure 2). There was no between-study heterogeneity (I2=0%). See online supplementary table S2 for details of the GRADE. Eight RCTs provided data on C-reactive protein, and there is moderate level of evidence for no effect of exercises (SMD −0.14 (95% CI −0.37 to 0.08), p=0.21). Between-study heterogeneity was negligible (I2=0%). Two RCTs provided data on creatine phosphokinase (a marker of inflammation in muscle tissue) and showed low-quality evidence for a tendency towards a beneficial effect of exercises on this outcome (SMD 1.31 (95% CI −0.20 to 2.82), p=0.09). Between-study heterogeneity was substantial (I2=62%). Meta-analyses of effects of exercises on erythrocyte sedimentation rate and C reactive protein. Values are shown as standardised mean difference with 95% CIs. *The quality of the evidence was evaluted according to the Grading of RecommendationAssessment, Development and Evaluation approach. Two RCTs included seven different cytokines and cytokine receptors as outcome measures (shown in online supplementary figure S2). Exercises reduced concentration of interleukin (IL) 17a, IL-18 and tumour necrosis factor alpha receptors, but increased levels of IL-6. Twelve RCTs provided data on diagnosis-specific disease activity scores, and the results showed high-quality evidence for a small beneficial effect of exercises (SMD of 0.19 (95% CI 0.05 to 0.33), p<0.01) (figure 3). There was no between-study heterogeneity (I2=0%). 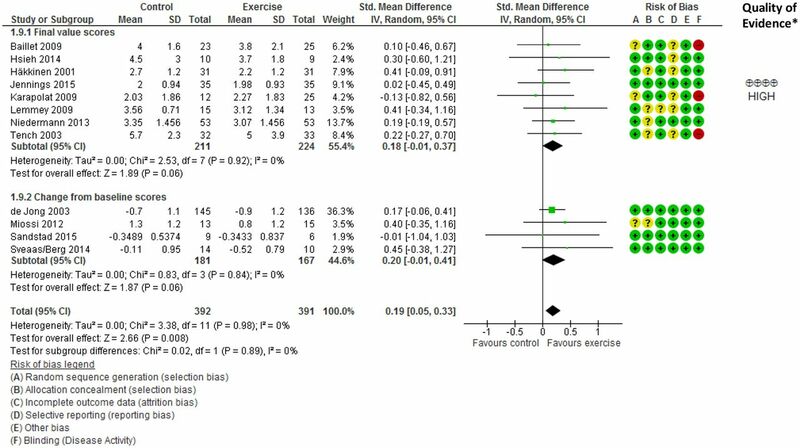 Meta-analysis of effect of exercises on diagnosis-specific disease activity scores. Disease activity was measured with Ankylosing Spondylitis Disease Activity Score, Bath Ankylosing Spondylitis Disease Activity Score, a disease activity score for Rheumatoid Arthritis patients and Systemic Lupus Erythematosus Disease Activity Index. Values are shown as SMD with 95% CIs. *The quality of the evidence was evaluted according to the Grading of Recommendation Assessment, Development and Evaluation approach. Four RCTs provided data on radiographic joint damage in small joints, and the results showed moderate quality evidence for a small beneficial effect of exercises (SMD 0.27 (0.07, 0.46), p<0.01) (figure 4). Between-study heterogeneity was negligible (I2=0%). Meta-analysis of effect of exercises on radiographic damage in small joints. Values are shown as SMD with 95% CIs. *The quality of the evidence was evaluted according to the Grading of Recommendation Assessment, Development and Evaluation approach. Twelve RCTs provided data on pain, and the results showed moderate quality evidence for a small beneficial effect of exercises (SMD 0.30 (95% CI 0.13 to 0.47), p<0.001) (figure 5). There was no between-study heterogeneity (I2=0%). Nine RCTs provided data on fatigue, and the results showed moderate quality evidence for a small beneficial effect of exercises (SMD 0.36 (95% CI 0.17 to 0.54), p<0.001). Between-study heterogeneity was negligible (I2=0%). Seven RCTs provided data on stiffness, and the results showed moderate quality evidence for a medium beneficial effect of exercises (SMD 0.47 (95% CI 0.26 to 0.68), p<0.0001). Between-study heterogeneity was negligible (I2=4%). Five RCTs provided data on number of swollen/tender joints, and the results showed low quality evidence for a small beneficial effect of exercises (SMD=0.35 (95% CI 0.03 to 0.67), p=0.03) (figure 5). There was no between-study heterogeneity (I2=0%). Four RCTs provided data on joint tenderness, and the results showed low quality evidence for no effect of exercises (SMD 0.19 (95% CI −0.10 to 0.48), p=0.20). There was no between-study heterogeneity (I2=0%). Effect of exercises on symptoms (A) Meta-analyses of effects of exercises on pain, fatigue and stiffness. (B) Meta-analyses of effects of exercises on count of joints with active inflammation (pain, swelling and tenderness and joint tenderness. Values are shown as SMD with 95% CIs. *The quality of the evidence was evaluted according to the Grading of Recommendation Assessment, Development and Evaluation approach. The effect of exercises on erythrocyte sedimentation rate was significant for exercise programmes with >12 weeks duration (SMD 0.43 (95% CI 0.15 to 0.72)), but not for exercise programmes with a shorter duration (SMD 0.01 (95% CI −0.25 to 0.27)), p=0.03 for the difference. (see online supplementary table S3 for details on subgroup analyses). For C-reactive protein, none of the trials had a duration >12 weeks. Except for erythrocyte sedimentation rate, the subgroup analyses on duration revealed no differences on the other outcomes. The subgroup analyses on exercise mode revealed no differences. Finally, no differences between the supervised and unsupervised exercise programmes on any outcomes were found. 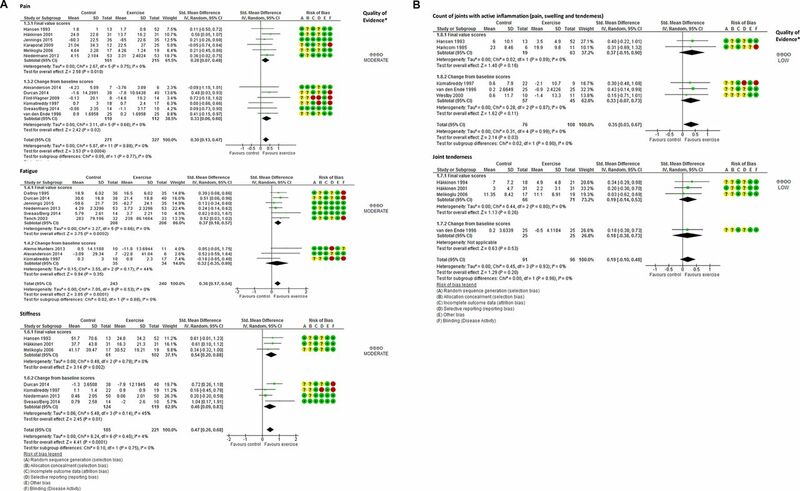 The same results were seen when using meta-regression to explore subgroup differences (relevant for meta-analyses with >10 included trials, ie, erythrocyte sedimentation rate, diagnosis specific disease activity scores and pain). Overall, in this systematic review, including 26 trials and 1286 patients with IRDs, the results suggest beneficial effect of exercises on disease activity in terms of inflammation, joint damage and symptoms. There was moderate to high quality evidence for small beneficial effects of exercises on diagnosis-specific disease activity scores, joint damage and erythrocyte sedimentation rate. Furthermore, there was moderate to low quality evidence for small to medium beneficial effects of exercises on symptoms. According to current treatment recommendations, exercise should complement pharmacological treatment in patients with IRDs.54 This meta-analysis showed that exercise may have beneficial effects on both inflammation and symptoms. Even though pharmacological treatment has been substantially improved in recent years, comprehensive pharmacological treatment is only recommended if the symptoms are caused by inflammation.54 55 Hence, in cases where the symptoms are not caused by current inflammation and for patients not responding to pharmacological treatment, cardiorespiratory and strength exercises are especially important as treatment alternatives. Although this review showed small to medium effect sizes, the studies consistently conclude with reduced disease activity and symptoms following exercise interventions, underlining the important role of exercises as treatment for patients with IRDs. In contrast to empirical beliefs that exercises might cause flare ups in disease activity, the beneficial effects on inflammation and symptoms ensure that exercises are safe for patients with IRDs. Thus, patients with IRDs can take advantage of the numerous health effects of cardiorespiratory and strength exercises. In addition to the disease-modifying effect, cardiorespiratory and strength exercises also have the potential to prevent comorbidity in patients with IRDs. There is growing evidence that these patients have an increased risk of CVD,56 and cardiorespiratory and strength exercises are recognised as cornerstones in the prevention of CVD.8 57 However, exercises to maintain flexibility and mobility, the exercise modalities traditionally recommended for patients with IRDs,6 do not protect against CVD.8 Thus, in light of the high risk of CVD associated with IRDs, the beneficial effects of cardiorespiratory and strength exercises should be exploited to optimise the treatment for patients with IRDs. The results of the current review are in accordance with two other meta-analyses showing that cardiorespiratory and strength exercises had beneficial effects on inflammation, pain and joint tenderness in patients with rheumatoid arthritis.18 19 To the best of our knowledge, this is the first meta-analysis summarising the effects of cardiorespiratory and strength exercises in patients with different IRD diagnoses, and the results support a hypothesis that exercises can counteract inflammation and clinical symptoms.14–17 Even if the exercise programmes included in this meta-analysis were in accordance with the ACSM’s exercise recommendations,8 the doses were relatively low in many of the studies. For instance, only four trials described a vigorous intensity level. Since the physiological responses to exercise, including the anti-inflammatory effect,17 are dependent on dosage, it may be hypothesised that higher doses could possibly have provided larger effect sizes. Further research is needed to gain more insight into the dose–response relationship for the effect of exercises on disease activity. The exploratory subgroup analyses showed that only exercise programmes with a long duration were effective in reducing erythrocyte sedimentation rate, whereas no studies provided data on effect of long-term exercise on C reactive protein. The anti-inflammatory benefit of exercises is described to be an acute effect of each bout of exercise,9 and the findings in this meta-analysis indicate that exercise may suppress inflammation over time. Furthermore, subgroup analyses suggested that only cardiorespiratory exercises and a combination of cardiorespiratory and strength exercises were beneficial in reducing fatigue. Except for this outcome, there were no significant differences between the different exercise modes, and more research is therefore needed to conclude on the most optimal exercise mode for reducing inflammation and symptoms in patients with IRDs. Strengths of this review are the comprehensive literature search, the large number of trials included, the grading of evidence and the statistical pooling in a meta-analysis. In addition, the assessment of direct measures of disease activity strengthens the validity of the results. Blinding of the participants in exercise interventions is not possible, and if the results had been based solely on patient-reported outcomes, a possible placebo effect could not have been ruled out. A limitation of this review is that follow-up studies were not included; hence, the long-term effects of exercises on disease activity are still unknown. Furthermore, adherence to the exercise interventions either as number of completed exercise sessions or as actual dosage of exercises was not explored. Moreover, only six different diagnoses were included with the majority of the patients having rheumatoid arthritis and axial spondyloarthritis, and therefore, the generalisation of the results to other IRD diagnoses should be done with caution. Based on an explorative approach, all types of disease activity measures were analysed in this systematic review, but only outcomes applied in two or more trials were pooled, which may have led to a reporting bias. In addition, as the fail-safe numbers indicated a possible risk of publication bias, inflated estimates of intervention effects cannot be ruled out. Furthermore, adverse events may have been under-reported, as only six trials addressed this issue. However, the risk of minor injuries associated with exercise is probably considered of minor interest, as this risk must be regarded as similar for IRD patients as for healthy adults. An important expression of safety for IRD patients is, however, the consistent result of no worsening of disease activity related to exercise shown in this meta-analysis. There is currently a focus on reducing years lived with disability globally, as these rates are declining much more slowly than mortality rates.58 This meta-analysis indicates that cardiorespiratory and strength exercises can reduce the burden of disease in patients with IRDs. As these patients often live many years with disability, it is of utmost importance to exploit the disease-modifying effects of cardiorespiratory and strength exercises. This meta-analysis showed that cardiorespiratory and strength exercises, dosed according to recommendations for improving physical fitness, have beneficial effects on disease activity in terms of inflammation, joint damage and symptoms in patients with IRDs. Therefore, cardiorespiratory and strength exercises can be considered as safe and effective therapeutic tools. Future studies are, however, needed to explore the most optimal exercise mode and dose. Furthermore, future reviews should aim at identifying potential moderating variables of exercises thorough meta-analyses based on individual patient data, as this is the preferred method of summarising RCTs. Cardiorespiratory and strength exercises, dosed according to recommendations for improving physical fitness, may have beneficial effects on disease activity in terms of inflammation, joint damage and symptoms, and should therefore be included as a part of the treatment programme for patients with inflammatory rheumatic diseases (IRDs). Cardiorespiratory and strength exercises are safe and beneficial for patients with IRDs, and this finding is contrary to empirical beliefs that exercises might cause flare ups in disease activity. By engaging in cardiorespiratory and strength exercises, patients with IRDs will be able to take advantage of the numerous health effects of increased physical fitness, such as better cardiovascular health.
. 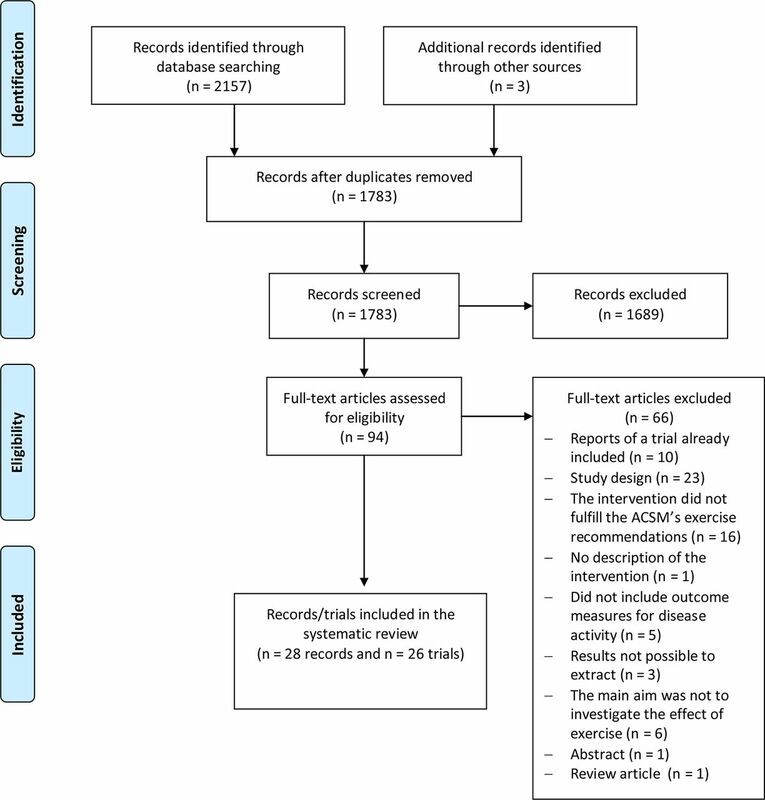 The effects of acute and chronic exercise on inflammatory markers in children and adults with a chronic inflammatory disease: a systematic review. Exerc Immunol Rev 2009;15:6–41. Comprehensive Meta-Analysis version 3 . Englewood, NJ: Biostat, 2014. Computer softeware available from http://www.comprehensive.com.
. Assessing risk of bias in included studies. In: Higgins JPT , Green S , eds. Cochrane handbook for systematic reviews of interventions. Chichester: wiley–blackwell, 2008:187–235.
. Addressing reporting biases. In: Higgins JPT , Green S , eds. Cochrane handbook for systematic reviews of interventions. Chichester: wiley–blackwell, 2008:297–325.
. Statistical power analysis for the behavioral sciences: Hillsdale, NJ Laurence Erlbaum, 1988.
. Analysing data and undertaking meta-analyses. In: Higgins JPT , Green S , eds. Cochrane handbook of systematic reviews of interventions. Chichester: wiley–blackwell, 2008:243–93.
. Using exercise training to counterbalance chronotropic incompetence and delayed heart rate recovery in systemic lupus erythematosus: a randomized trial. Arthritis Care Res 2012;64:1159–66.
. Effect of 8 wk of bicycle training on the immune system of patients with rheumatoid arthritis. J Appl Physiol 1993;75:1691–5.
. Efficacy of low load resistive muscle training in patients with rheumatoid arthritis functional class II and III. J Rheumatol 1997;24:1531–9.
. A randomized controlled trial to evaluate the effectiveness of an exercise program in women with rheumatoid arthritis taking low dose prednisone.. J Rheumatol 2000;27:1674–80.
. Are swimming or aerobic exercise better than conventional exercise in ankylosing spondylitis patients? a randomized controlled study. Eur J Phys Rehab Med 2009;45:449–57. Acknowledgements We thank librarian Kari Engen Matre, Diakonhjemmet Hospital, for technical support in developing and running the literature searches. We thank Suzanne Capell for English editing of the manuscript. Contributors SHS, KBH and HD designed the study. All authors acquired the data. SHS and GS coded and analysed the data. All authors drafted the manuscript and approved the final version to be published. Funding This work was supported by The Norwegian Fund for Post-Graduate Training in Physiotherapy.